There’s nothing worse than leaving a holiday destination, only to realise you’ve left something behind. Especially when that something is a treasured teddy belonging to your kids. Imagine then, having the beloved toy posted back to you, along with a series of photographs detailing a teddy adventure. 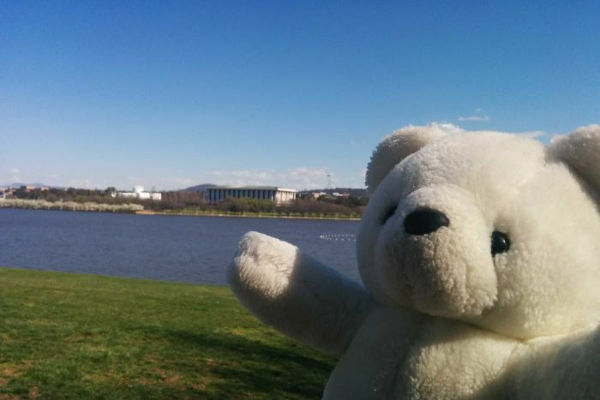 Here’s how Teddy the teddy took leave of his children, and conquered Canberra. 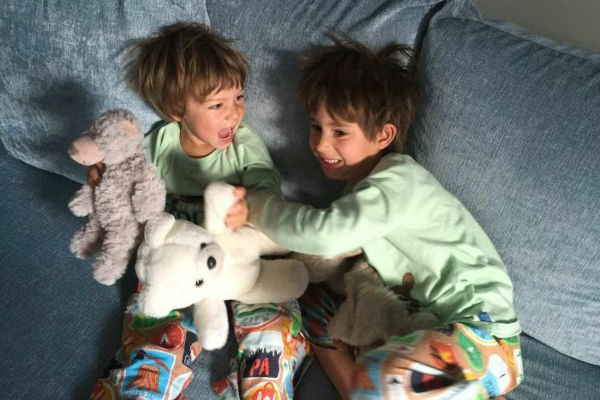 Sydney mum Margie Simpson-Lee left Canberra with her sons Oscar and Archie earlier this month, continuing on a family holiday. But an hour out of the nation’s capital, it dawned on Margie, she’d forgotten to pack one very important passenger. “My heart sank, not only do the boys love their Teddy, but so do I. I’ve had him since I was a little girl. Teddy is very special,” Margie tells Daily Mail Australia. But all was not lost. Teddy was found at Hotel Realm, and given the royal treatment by staff member Robbie Allen. 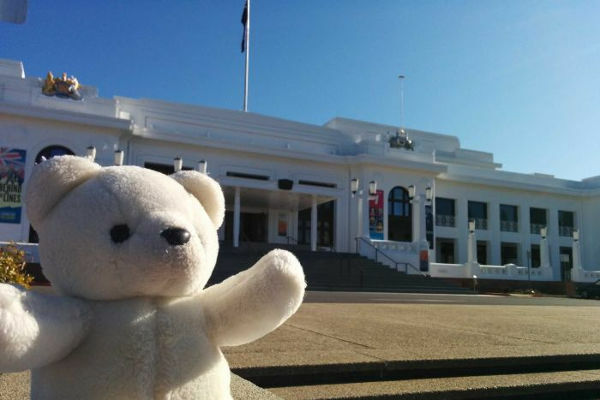 He decided to give the little bear a holiday of his own, taking him on a tour of Canberra’s landmarks. 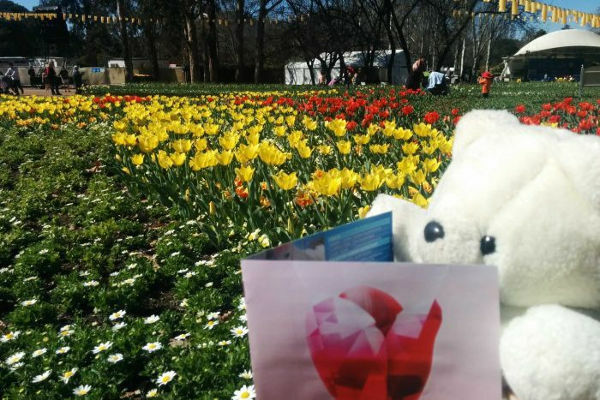 Teddy took in the magnificent display at Floriade and visited the old and new Parliament Houses. His adventures were immortalised in selfies, which Robbie printed out. 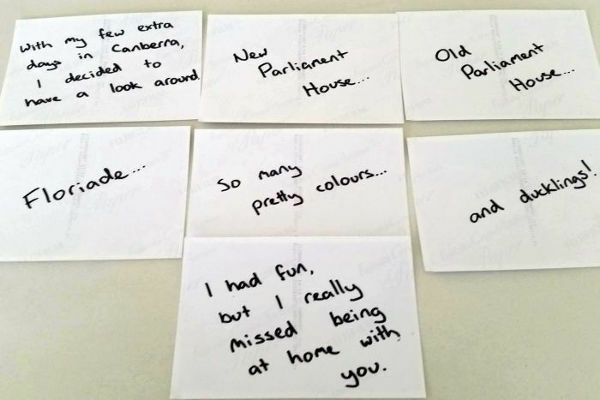 He then took the time to jot cute notes on the back of each. Then he sent Teddy on his way, the much-loved toy arriving in New South Wales to a very happy and surprised family. Margie’s only lament is that Teddy’s trip was even better than the one she’d had with her boys, “We missed Floriade altogether. We only got to Questacon”. Margie says six-year-old Archie loved the photos, and “laughed his head off”. Robbie says he’d met the family during their stay, and when he heard they’d left the teddy behind, he was keen to help out. “I thought I’d take him on a holiday before he goes home. I’m just glad the teddy bear made it home,’ Robbie says. It’s not the first time a cheeky toy has taken leave of its family to indulge in a break – check out Hobbes’ airport adventure.